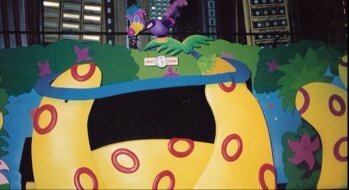 Many of you will no doubt have heard of SEGAWorld Sydney, that once stood proudly on Darling Harbour. Although housed in a grand building and offering a variety of attractions, SEGAWorld Sydney was only open for four brief years during 1997 and 2000, with the park closing November 2000 and the building being demolished in 2008. 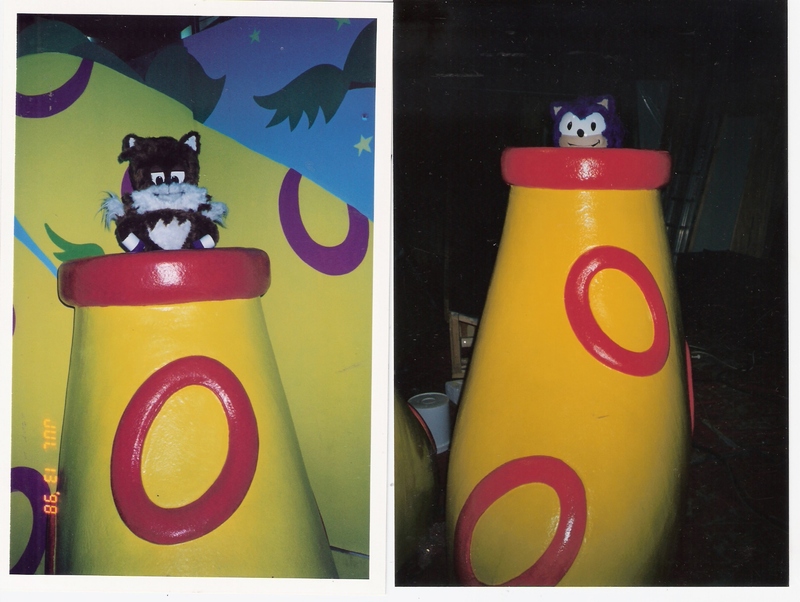 The park was host to many rides and a whole bunch of merchandise that now goes for crazy prices on ebay, but one of the main attractions was a live hour-and-a-half stage show involving actors dressed as a host of characters and a plot loosely based around the SatAM universe (with some pretty cheesy songs which you can hear if you’re lucky/unlucky enough to own the “Sonic In Sydney” soundtrack CD). 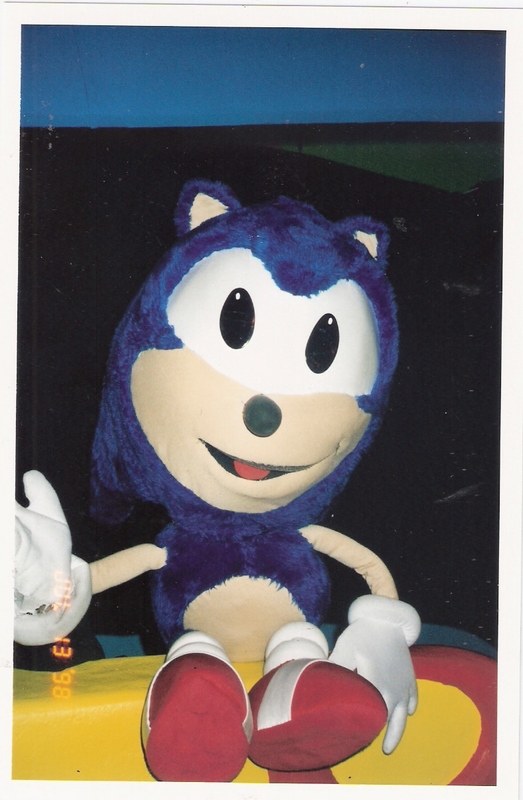 Unbeknownst to most this show was not the only to grace the SEGAWorld Sydney stage. 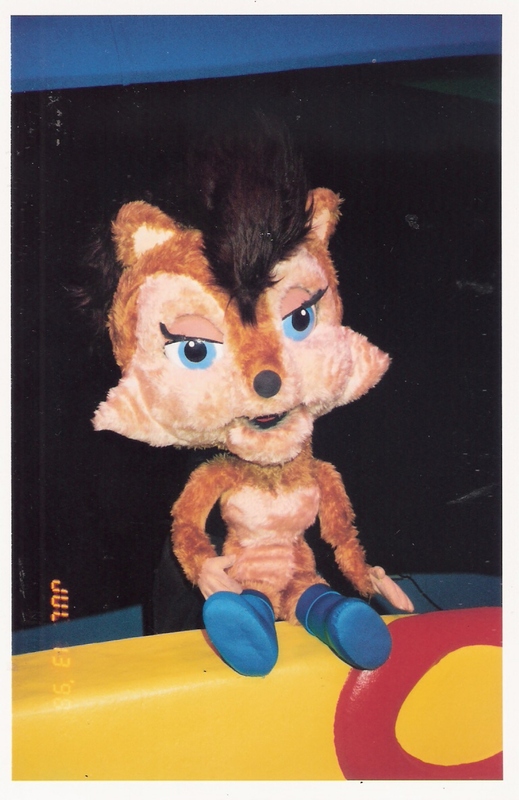 Forumer SonikkuForever has been doing some digging and has been in touch with Philip Einfeld of Philip Einfeld’s Puppetoons, who was comissioned to produce an puppet show to replace the stage show. 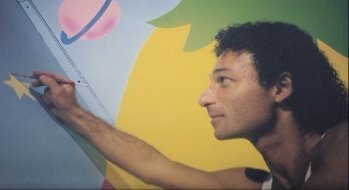 Philip has been kind enough to share photos from the show along with a description in his correspondance, and considering I think very few have heard of this, or even know this show existed, it deserves mentioning here on TSS. 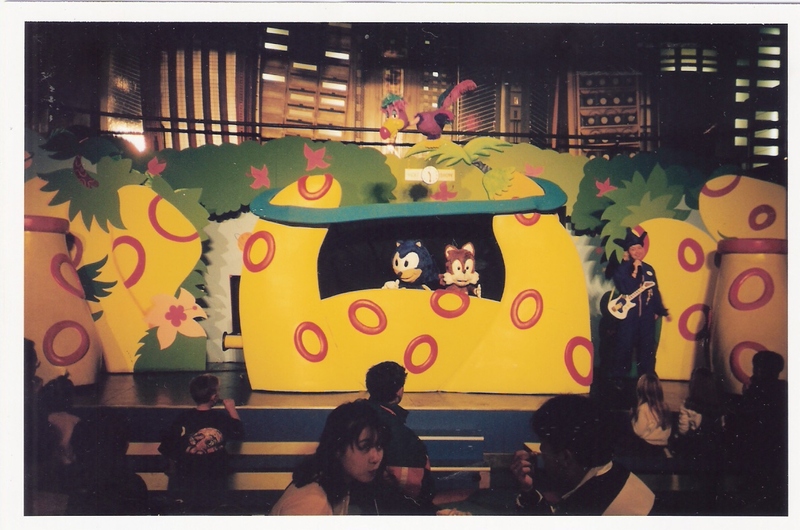 The Sonic the Hedgehog Puppet Show performed 3-4 half hour shows daily in Sega World Sydney throughout 1998-99. It was performed on center stage, pretty much in the middle of Sega World next to the food court. People could dine at their tables while watching the show. The show was designed, written, produced and performed by Phillip Einfeld Puppetoons. It involved 2 puppeteers and a live hostess. 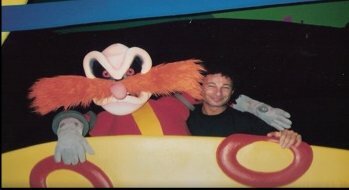 Dr. Robotnik had devised a plan to finally defeat his arch enemy Sonic. He has concocted a robot making machine that would build the ultimate, evil, robot with every device needed to catch Sonic. 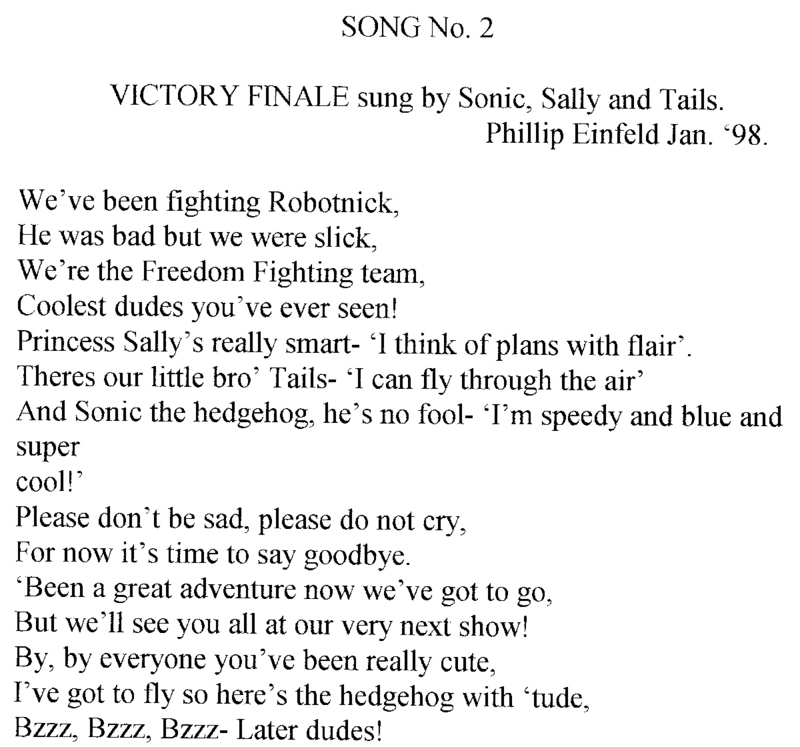 With the help of his buddies Tails and Princess Sally, Sonic defeats the robot (Grounder) who turns out to be a bit slow physically and mentally. 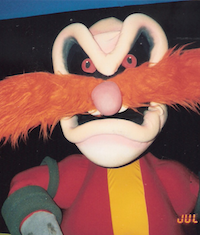 Robotnik blasts off back to his secret laboratory in anger and everyone lives happily ever after. Originally, a show with dancers and costumed characters performed on the stage. The soundtrack you have heard is from that show. I think I may have the puppet show sound track in my files somewhere but it could take some time to find it. 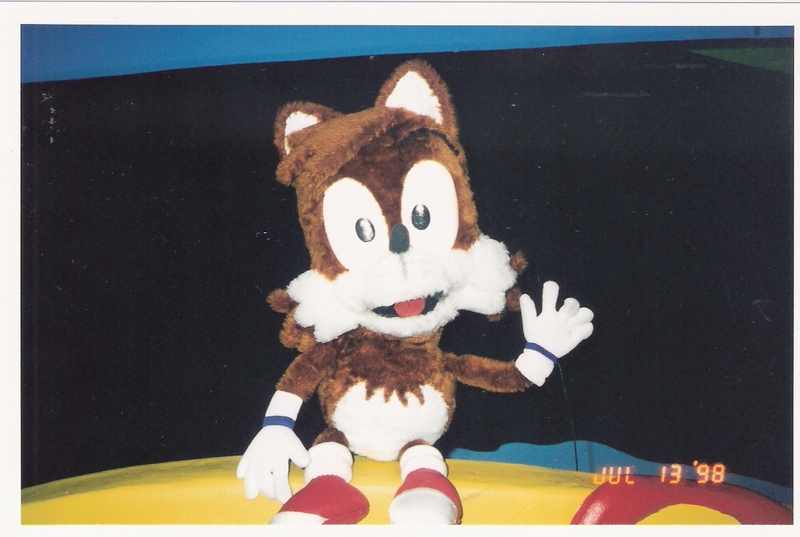 When Sega decided to disband the original stage show, due to it not being very dynamic, late 1997, I was brought in to replace it with the puppetshow and some animatronic displays. 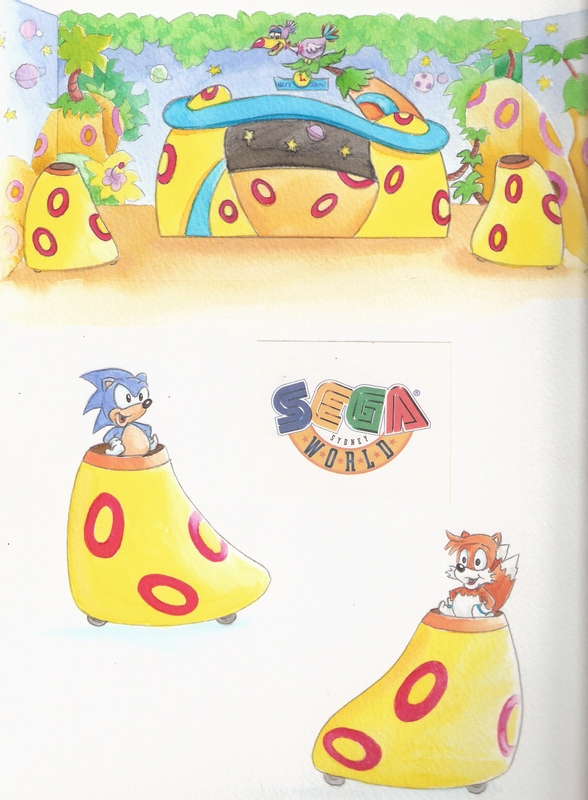 I redesigned the stage to represent planet Mobius, on either end were magic mountains, every 15mins except during show times, audio animatronic Sonic and Tails characters rose out of top of mountains and spoke to each other and audience, anouncing show times and upcoming events in Sega World. In center of stage stood the large, fully sculpted puppet theatre. 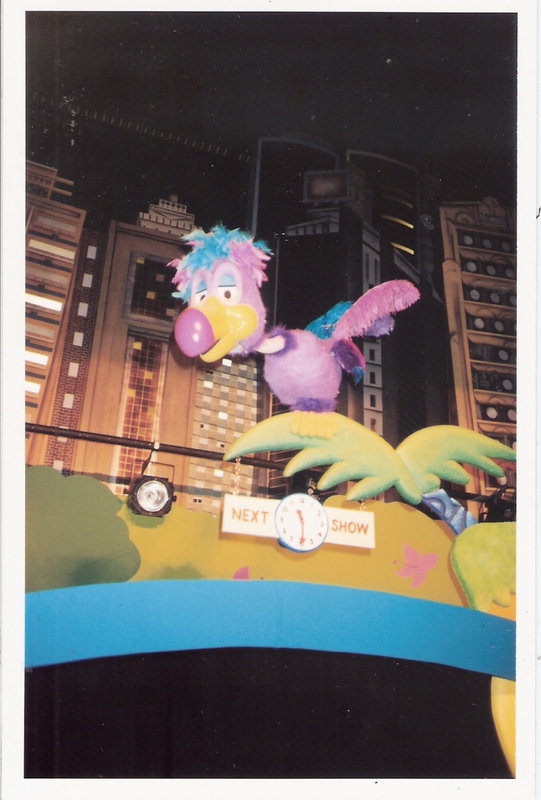 Perched above the theatre was a big ,purple, animatronic bird that spoke to the audience. Above the stage was a large vid screen. 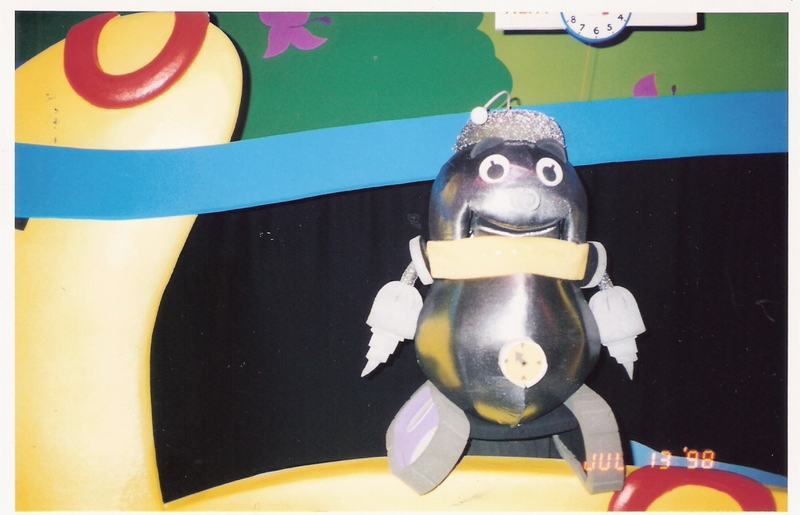 Segments of the puppet show where filmed and appeared on the screen i.e when Robotnik blasts off in his space ship he is seen flying across a planet strewn sky above the audience (on the screen). 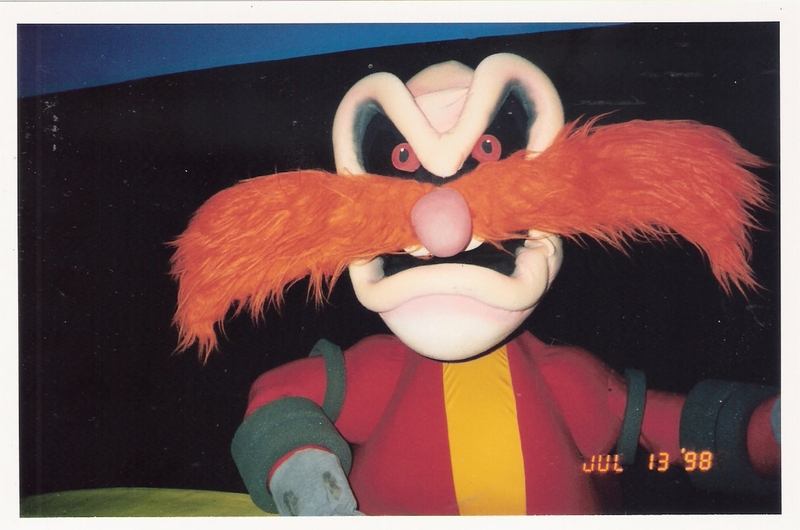 The puppets were large, muppet style creations, Sonic, Tails, Princess Sally, Dr. Robotnik and Grounder the Robot. A large ‘Robot making Machine’ prop was made along with special Sonic hats for children chosen from audience to wear. The show included much audience participation. 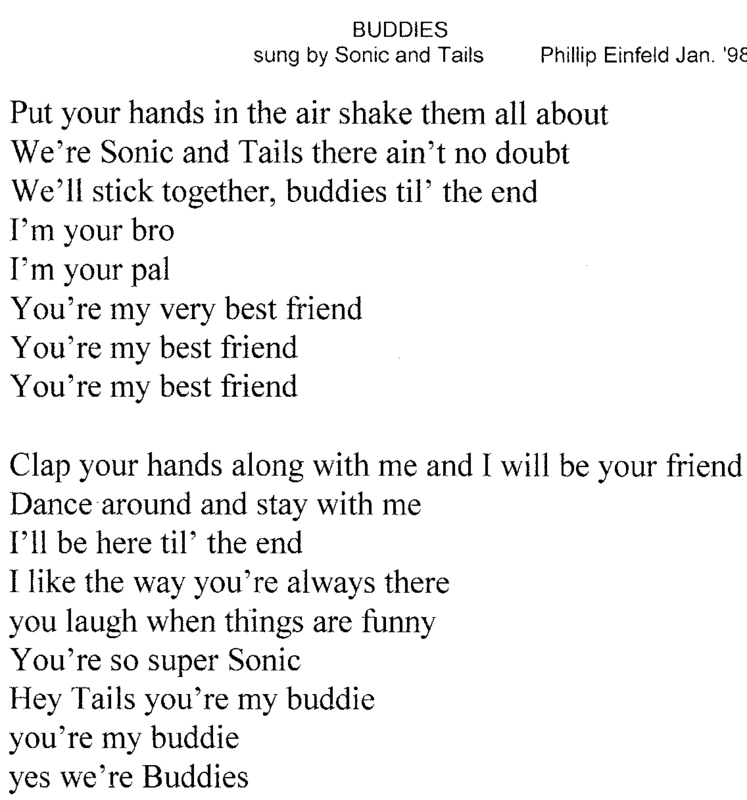 I had 3 original songs recorded (I attached the lyrics). 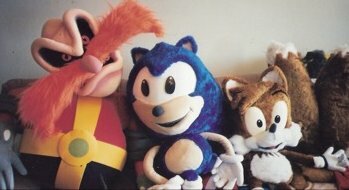 I used all my own people for the voices (all approved by Sega) From memory I voiced Grounder, Dennis White voiced Dr.Robotnik, and Sonic, Tails and Sally were voiced by Alexis Nagy. The original music and songs were written and produced by myself and Mark Rosenberg. Many thanks once again to SonikkuForever and Philip for giving us a peak into one of the many forgotten chapters of SEGAWorld! Did you ever witness this show or any other on a visit to SEGAWorld Sydney? Let us know in the comments! For more discussion, head to the thread in the SSMB.